The United Nations University project Agro-forestry: An Alternative to the Destruction of Tropical Forests was initiated as part of the Natural Resources Programme in order to help develop more knowledge about this relatively new discipline focusing on soil use management. Agro-forestry, which is based on the traditional practice throughout the tropics of combining tree cultivation with crop or livestock production, has only recently gained formal recognition in land-use and development programmes It aims at contributing to the improvement of conditions of life for an estimated 400 million people practicing shifting cultivation and at helping to reduce pressure on the world's remaining forests, especially tropical rain forests. 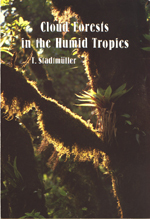 A brief study on cloud forests was included in the overall project because of the particularly important role they play in increasing precipitation and run-off, and the threat to their existence from accelerated clearing of "unused" lands in tropical regions.